Back in 2010 when I first began this blog, I posted lists of companies that were applying advanced biotechnology in various sectors of the biofuels industry. Now that I’ve returned to the blog three years later, my intention is to update those lists, perhaps utilizing somewhat different categories with which to group the companies in the industry. So, I thought I would begin that effort by focusing on one of the most important, or at least most highly anticipated, categories of companies, those who are developing or implementing technologies for cellulosic ethanol: that is, methods of producing fuel ethanol that do not depend on the use of food crops as the starting biomass, but which instead utilize feedstocks like wood, agricultural waste products, or municipal solid waste. As readers of my Biofuel Policy Watch blog are aware, much of the controversy over ethanol mandates in the U.S. and around the world centers on the fact that there is much interest in getting away from the use of corn or other food crops to produce ethanol, but the technologies to produce it from non-food biomass have been slower to develop than originally expected. So, there are lots of people waiting with baited breath for cellulosic ethanol plants to come on line and begin producing significant amounts of fuel ethanol and generating Renewable Identification Numbers (RINs) that can be used for compliance with EPA’s volume mandates under the Renewable Fuel Standard. In this entry and the one that follows, I’ll list the companies that are operating, or which have begun construction of, demonstration-scale or commercial-scale cellulosic ethanol plants in the U.S., Canada, Brazil and Europe. Rather than present company profiles (as I did in my 2010 posts), for each company I’ll briefly summarize its activities in building pilot, demonstration and commercial plants. It is also important to note that, unlike most other entries in this blog, the focus here is not the use of advanced biotechnology – although many of these companies are using genetically modified yeast strains or cellulloytic enzymes produced through biotechnology, that is not universally the case, and these posts should not be construed to imply that any company is using genetically engineered material unless explicitly stated. In this first post, I’ll list companies operating or building plants in North America and in a second post I’ll list projects in Europe and Brazil. Each summary is organized alphabetically by company name. I’ll use the abbreviations MGY for million gallons per year, GPY for gallons per year, and MSW for municipal solid waste. Abengoa BioEnergy. Abengoa has previously demonstrated its technology at a pilot plant in York, Nebraska and at a demo plant in Salamanca, Spain. The company is currently completing its first commercial plant in Hugoton, Kansas. Construction at this facility began in September 2011 and is expected to take 24 months and be completed in the fourth quarter of 2013. This facility is being partially funded by a $132 million Department of Energy (DOE) loan guarantee. When completed, the Hugoton plant have an expected capacity of approximately 24 MGY. Abengoa plans to begin production in late 2013 and to be producing fuel at rates near capacity by the second quarter of 2014. Feedstocks are expected to include agricultural residues, dedicated energy crops and prairie grasses. Abengoa plans to construct additional similar cellulosic ethanol production facilities at other sites, including some sites co-located with Abengoa cornstarch ethanol plants. American Process Inc. American Process Inc. (API) is developing a project in Alpena, Michigan capable of producing up to 900,000 GPY of cellulosic ethanol from woody biomass (mixed hardwood). The technology extracts the hemicellulose portion of woody biomass using hot water and hydrolyzes it into sugars. API began commissioning operations in the summer of 2012 and production start-up is expected to begin in 2013. It has been reported that API’s technology partners include GreenTech America (yeast strains), Novozymes (enzymes) and ArborGen (purpose-grown energy crops). Beta Renewables. Beta Renewables is a joint venture between Gruppo Mossi and Chemtex. The company completed construction on its first commercial-scale facility in Crescentino, Italy in the summer of 2012. Beta Renewables is planning a U.S. commercial facility in Sampson County, North Carolina, that is expected to have a 2014 start-up at 20 MGY capacity. Beta Renewables also plans to build a 21.6 MGY cellulosic ethanol plant in Brazil with Brazilian company GraalBio which is expected to come online in 2014. Blue Sugars Corporation. Blue Sugars, formerly KL Energy, has developed a process to convert cellulose and hemicellulose into sugars and ethanol using a combined chemical/thermal-mechanical pretreatment process followed by enzymatic hydrolysis and co-fermentation of C5 and C6 sugars. The process can be used with a wide variety of cellulosic feedstocks, including woody biomass and sugarcane bagasse. Blue Sugars has a joint development agreement with Petrobras America Inc., under which Petrobras has invested $11 million to modify Blue Sugars’ 1.5 MGY demonstration facility in Upton, Wyoming to allow it to process bagasse and other biomass feedstocks. In April 2012 Blue Sugars generated approximately 20,000 cellulosic biofuel RINs, the first such RINs generated under the RFS program, but these were exported to Brazil and not used in the U.S. market. However, it was just announced in February 2013 that this facility had filed for Chapter 11 bankruptcy in October 2012, with a restructuring planned. BlueFire Renewables Inc. BlueFire operates a demo facility in Anaheim, California, and is building a commercial plant in Fulton, Mississippi. Construction of the commercial plant is expected to be complete in 2014, with an expected capacity of 19 MGY. The technology uses agricultural residues, wood residues, municipal solid wastes and purpose grown energy crops. Dupont Biofuel Solutions. Dupont has been operating a pilot plant in Vonore, Tennessee and broke ground on a commercial cellulosic ethanol facility in Nevada, Iowa, on Nov. 30, 2012. This facility, costing more than $200 million, is expected to be completed in mid-2014, and will be among the first and largest commercial-scale cellulosic biorefineries in the world. This new facility is expected to generate 30 MGY cellulosic biofuel produced from corn stover residues (i.e. corn stalks and leaves). Enerkem Inc. Enerkerm is operating a 1.3 MGY demo plant in Westbury, Quebec. The company is in the process of building its first commercial-scale facility in Edmonton, Alberta and plans to begin operations in early 2013. Enerkem’s facility will use a thermochemical process to produce syngas from municipal solid waste (MSW) and then catalytically convert the syngas to methanol. The methanol can then be sold directly or upgraded to ethanol or other chemical products. At full capacity this facility will be capable of producing 10 MGY ethanol. The company is also planning a U.S. commercial site in Pontotoc, Mississippi, with construction to begin in 2013 and be complete in 2015. Fiberight Inc. A plant for conversion of MSW to ethanol is in operation at Lawrenceville, Virginia (1 MGY capacity) with a larger plant planned by modifying an idled corn ethanol plant in Blairstown, Iowa to allow for the production of 6 MGY of cellulosic ethanol from separated MSW and industrial waste streams. Construction is expected to begin in early spring 2013 and the company expects that it will take approximately 6 months to complete The British company TMO Renewables is supplying fermentation technology. Fiberight uses an enzymatic hydrolysis process to convert the biogenic portion of separated MSW and other waste feedstocks into ethanol. In January 2012 Fiberight was offered a $25 million loan guarantee from USDA. Additional plants are planned for 2014 and 2015. Fulcrum BioEnergy. Fulcrum operates a demonstration plant in Durham, North Carolina. The technology involves conversion of syngas to ethanol. A commercial cellulosic ethanol facility is planned for McCarran, Nevada (near Reno), which will use MSW to produce ethanol. The estimated capacity of this plant is 10 MGY, with operations scheduled to begin in 2014. Fulcrum received a $105 million conditional loan guarantee from the USDA for the construction of this plant. Inbicon. Inbicon uses steam, enzymes (from Novozymes and DuPont Danisco) and yeast to convert soft lignocellulose (e.g. 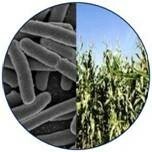 wheat straw, corn stalks, energy grasses) into ethanol. A demonstration facility in Denmark (1.5 MGY ethanol) has been operational since 2009. A U.S. commercial facility (10+ MGY capacity) is planned for Spiritwood, North Dakota, with estimated completion in the third quarter of 2015, as well as a commercial plant in Denmark which would begin operations in early 2016. Inbicon also recently announced a collaboration with ETH in Brazil that could result in a cellulosic ethanol plant in Brazil as early as 2015. INEOS Bio. INEOS Bio has developed a process for producing cellulosic ethanol by first gasifying cellulosic feedstocks into a syngas and then using naturally occurring bacteria to ferment the syngas into ethanol. The project has received funding or loan guarantees from DOE and USDA. INEOS has a pilot plant in Fayetteville, Arkansas, and completed construction on a Vero Beach, Florida facility in June 2012. The company entered the start-up phase of cellulosic ethanol production at this facility in November 2012, and expects to be producing cellulosic ethanol at levels near the facility’s capacity of 8 MGY throughout 2013. Iogen. Iogen has had a 1 MGY capacity demo plant in Ottawa, Ontario operating since 2005. Iogen is also building a plant in Brazil, with Raizen, which has reportedly demonstrated production of ethanol from sugarcane bagasse. KiOR. This company is not producing ethanol, but instead is producing cellulosic gasoline, diesel and jet fuel at an 11 MGY commercial-scale facility in Columbus, Mississippi, using a catalytic cracking technology. It is one of the companies that the U.S. EPA is counting on to produce cellulosic biofuels under the RFS in 2013, and to be issuing RINs as early as the first quarter of the year. LanzaTech. The company’s technology combines microbial fermentation with other physicochemical processing, and uses agricultural or forestry wastes as well as MSW. The company operates a pilot plant in Auckland, New Zealand (15,000 GPY), and two demo plants in China (each 100,000 GPY). LanzaTech is planning to build a commercial facility, the Freedom Pines Biorefinery, at the old Range Fuels site in Soperton, Georgia. This plant is expected to be in operation by 2014, with a 4 MGY capacity. Lignol. This Canadian company is using a delignification process first developed for the pulping industry to produce a cellulose/hemicellulose wood pulp that can be used to produce ethanol. The company has operated what it calls a pilot plant in Burnaby, British Columbia, which reportedly has a capacity of 100,000 liters per year (26,417 GPY). Mascoma Corporation. Currently operating a demo plant in Rome, New York (200,000 GPY capacity). Mascoma is developing a commercial plant in Kinross, Michigan, in partnership with Valero, with a capacity of 20 MGY, using consolidated bioprocessing with its proprietary microorganisms. Groundbreaking is expected in 2013, with construction complete 2014-15. The company is also planning a second plant in Drayton Valley, Alberta, expected completion 2015-16. POET-DSM. POET has been operating a 20,000 GPY pilot plant in Scotland, South Dakota since 2008. The POET-DSM joint venture is building a 20-25 MGY plant in Emmetsburg, Iowa that will utilize corn stover as feedstock. The technology features acid pretreatment followed by the use of DSM enzymes and yeast for fermentation. The plant is expected to be complete by the end of 2013 but not producing commercial ethanol until 2014. POET reportedly plans to build cellulosic facilities at all their existing corn ethanol plants. Woodland Biofuels Inc. The company has completed construction of a Sarnia, Ontario demonstration plant. The plant is now in the initial stages of commissioning, with ethanol production expected in the first quarter of 2013. The company says that it is also exploring possible commercial sites. The technology uses gasification to convert biomass into syngas, followed by chemical catalysis to ethanol. The Sarnia demo facility will be capable of handling 7.2 metric tons per day of wood waste, or about 2,400 metric tons per year. World Ethanol Institute LLC. This company, an affiliate of World Paulownia Institute LLC, reportedly has a 20 MGY plant under construction in Lenox, Georgia. The company is planning the use of its proprietary lines of a purpose-grown tree, Paulownia, in a process combining steam explosion and acid hydrolysis, followed by standard fermentation, reportedly using a modified yeast from another company. Construction is expected to be completed by the end of 2013. ZeaChem Inc. ZeaChem is operating a 250,000 GPY demo plant in Boardman, Oregon. The company is building a larger biorefinery at same site in Oregon, with a USDA grant. The plant will have an expected capacity of 25 MGY, but is not expected to be producing cellulosic ethanol until 2014 or 2015. The company’s technology is hybrid biochemical fermentation and thermochemical gasification, using the termite gut microorganism Morella thermoacetica in the fermentation. ZeaChem claims that its process is feedstock agnostic. Posted on February 21, 2013 by dglassassociates. This entry was posted in Companies. Bookmark the permalink.